Kindly go through the procedure of the experiment 'modeling resting potential of neurons' for general introduction to the simulator. 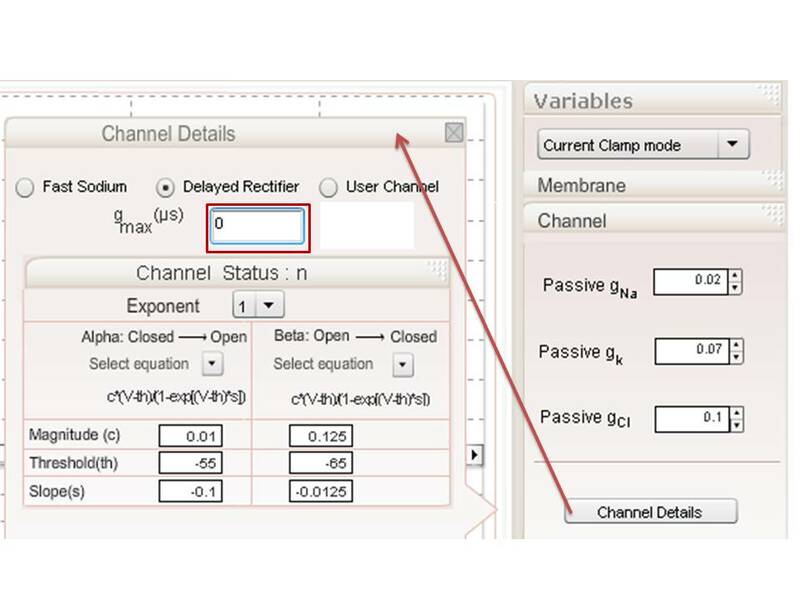 In this exercise we are studying the importance of Na+ channel in action potential initiation and understanding the dynamics of Na+ channels in detail.Na+ channel consists of activation and inactivation gates, both these gates regulate the ionic movement across the membrane. The activation gate described by m3 and inactivation gate described by h. We will explore m,h,gNa dynamics in this exercise, mark m,h,gNa in bottom plot, gNa is plotting in 0-30pS scale. Press Stim1/ Stim2 (with default stimuli) to simulate the neuronal membrane and inject current to generate spike. By marking the variables m,h and n in bottom plot are the HH parameters varies between 0 and 1. Recall from the theory that fast sodium channel dynamics is proportional to m3h and potassium channel dynamics proportional to n4. Neuronal membrane is at resting potential the sodium conductance will be at zero, because the activation variable m closes to zero and inactivation variable rest around 0.5(see the above figure) . When a stimuli (Stim1 / Stim2) depolarize the neuronal membrane the Na+ activation gate m opens, the conductance of sodium increases and the membrane depolarizes (see the above figure). As a result membrane voltage level increases, inactivation gate (h) remains close a while (activation gate m remains open) (see the above figure). Opening of K+ channels cause repolarization of the membrane (without these channels the membrane remains depolarize) this we can simulate by changing the conductance of K+ channels to zero. After the above changes apply Stim1, the neuronal membrane will depolarize but not repolarize because of absent of K+ channels, the Vm remains high (see the above figure). 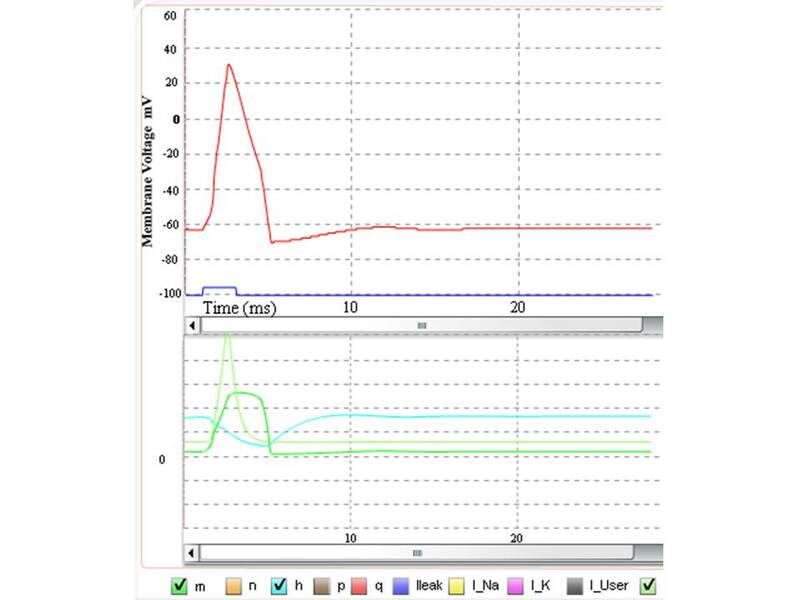 Note that the spike peak is around 50mV without active K+ channels, the cell repolarize the Vm decline from the peak, measure the new resting value. 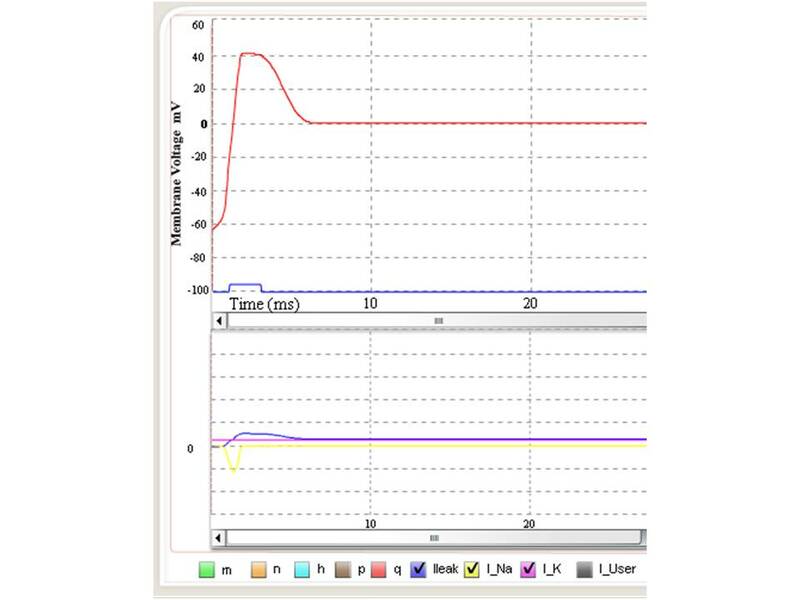 The new resting value is contributed by leakage channels and (not fully closed Na+ channels). The dynamics of voltage gated channels are described by activation variable (m) and inactivation variable (h) based on membrane voltage. The parameter m is the probability that the activation gate to be open (m3). The parameters including the maximum conductance of Na+ channel can be accessed in a sub-window called m-window in the channel details of fast sodium channels (see the figure below). n sub-window inside the channel details of fast sodium channels (see the figure below) describes the inactivation gate. The dynamics of activation governed by two rate variables, 1) α (alpha) is the rate at which the channel closed to open and β (beta) is the rate at which the channel open to close. ) α and β are determined by exponential function, user have the ability to choose different exponential function which already defined or user can define its own function to simulate (see the figure below, right side red box). 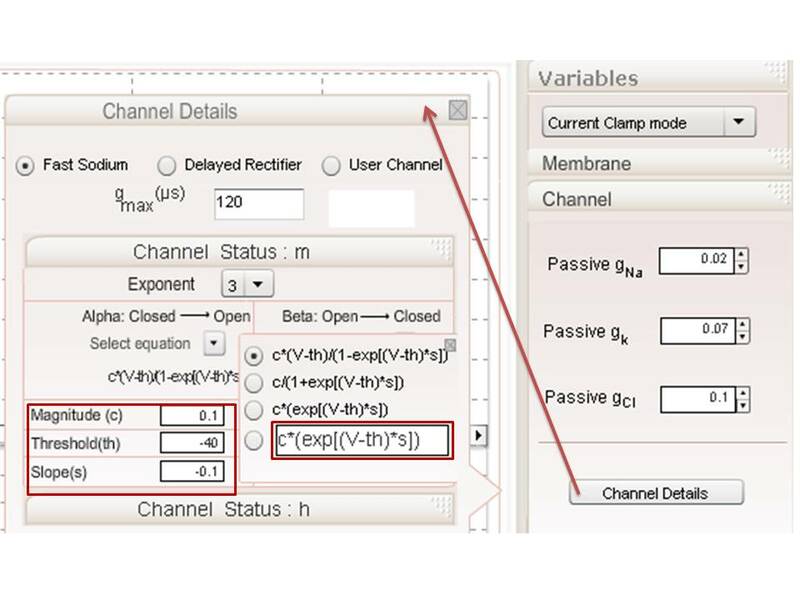 The user has the accesses to various parameters (like Magnitude, Threshold and Slope) of α and β channel states (see the figure above, left side red box). The inactivation gate described in n sub-window, user has the accesses to various parameters of α and β rate variables. Neuron Simulator is based on David S. Touretzky's Hodgkin-Huxley Simulator.